Who Killed Hizballah's Terror Master? It took the assassination of Imad Mughniyah for the world to finally get a glimpse of what this most elusive and ruthless of Islamic militants actually looked like. He lived in the shadows of Middle Eastern violence his entire adult life, allegedly altering his features through plastic surgery, travelling on an Iranian diplomatic passport on unscheduled flights and never giving interviews or releasing video-taped statements. The only pictures of Mughniyah, 45, publicly available were a few grainy black and white snaps from the 1980s, portraying a serious, sallow-faced young man with a black pointed beard. Hours after announcing his death in a car bomb blast in a Damascus suburb, the Shi'ite Hizballah organization's television channel, Al Manar, broadcast a more recent picture of Mughniyah. It showed a plump, middle-aged man wearing combat fatigues and a forage cap and sporting a thick beard streaked with grey. His wire-framed spectacles gave him a benign, almost professorial, look, belying the fact that Mughniyah stood accused of killing more Americans than any other militant before the attacks of September 11, 2001. 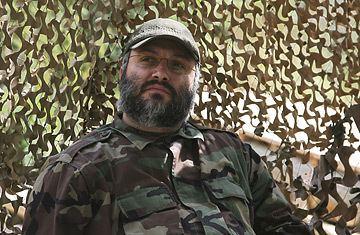 Indeed, before Osama bin Laden, there was Imad Mughniyah. And his death is a serious blow to Hizballah. The Shi'ite organization rarely talked in public about Mughniyah and his alleged exploits from the 1980s. Sheikh Sobhi Tufayli, a founder of Hizballah who led the organization between 1989 and 1991, once told me that Mughniyah was innocent of the charges leveled against him by the U.S. "He had nothing to do with it," the gruff cleric said, then added "Besides do you think I would tell you if he did?" In a July 2003 interview, Sheikh Hassan Nasrallah, the current Hizballah leader, told me that the U.S. accusations against Mughniyah were "just accusations." "Can they provide evidence to condemn Mughniyah?" he asked. But he added "Hajj Imad is among the best freedom fighters in the Lebanese arena. He had a very important role during the occupation [of southern Lebanon by Israel]. But as for his relationship with Hizballah, we maintain the tradition of not discussing names." It's true that the long international hunt for Mughniyah threw up many accusations about his misdeeds in the 1980s, but not much evidence has been produced to back them. Although he is alleged to have masterminded the suicide bomb spectaculars against U.S. targets in Lebanon in the mid-1980s and run the Beirut kidnapping networks that took dozens of foreigners hostage, the only crime for which he has been indicted by the U.S. is the hijacking of a TWA airliner in 1985 in which a U.S. navy diver was killed. Indeed, such was Mughniyah's mythical status that sometimes it was not always certain if he really existed at all. "I sometimes would ask myself if Mughniyah was a real person or a figment of imagination," said Magnus Ranstorp, a Hizballah specialist at the Swedish National Defense College in Stockholm who has traced Mughniyah's activities for years. "But the intelligence agencies I was in contact with were under no illusions. He was the real deal." Still, despite the scenes of mourning in Lebanese Shi'ite circles that has greeted Mughniyah's death, his high profile earned the irritation of some grassroots Hizballah fighters busy battling Israeli occupation troops in south Lebanon in the 1990s. "They talk about Imad Mughniyah, but what did he do?" a Hizballah fighter once grumbled to me. "They suspect him of kidnapping American journalists, blowing up the French paratroops and the U.S. embassy. But things we did in the south [fighting Israeli troops] were militarily worth a hundred times more than what they claim Mughniyah did. Kidnapping is the easiest thing in the world. The CIA is crazy." During the chaotic days of the 1980s, Mughniyah was able to travel with relative ease around the Middle East and even in Europe. In the mid-1980s, the CIA cut a deal with Lebanese military intelligence to fund a sophisticated listening post in the Lebanese mountains that could eavesdrop on conversations throughout the Middle East and was staffed by fluent Hebrew, French and Farsi speakers. In exchange, Lebanese intelligence was obliged to pass on any information gleaned about the kidnappers of Westerners. In 1986, Lebanese intelligence used a voice frequency sample to trace Mughniyah to a hotel in Paris. A former Lebanese officer involved in the operation told TIME that French intelligence agents met Mughniyah in his hotel room, but did not arrest him. According to Ranstorp, from the early 1990s, Mughniyah was "extraordinarily cautious," in covering his trail, dividing his time mainly between Beirut and Tehran where he moved with his family in 1990. Damascus, therefore, seems an unlikely location for Mughniyah's enemies to catch up with him. "I always thought they would get him in Beirut, so what does it mean that he was killed in Damascus?" asked Robert Baer, a former CIA officer who tracked Mughniyah in 1980s Beirut and is also TIME's intelligence analyst. Hizballah has blamed Israel, and the organization's expected retaliation will likely aim in that direction. But could the $5 million price tag for Mughniyah's head have proved too tempting for a member of the Syrian regime? Or was it a favor by Damascus to the U.S. in exchange for an easing of international pressure? The recent history of the Middle East is littered with unsolved assassinations. And perhaps that is for the best. Sometimes the truth can be more dangerous than the crime itself.